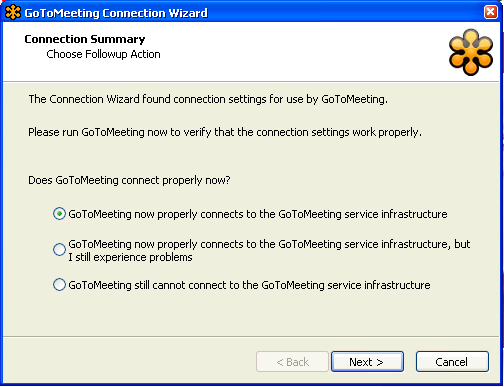 You install latest version of GoToMeeting (GTM) application 1350. After installing this version side by side to the previous versions, your GTM starts to fail at the launch. You have Audio disabled in either RDP and/or XenApp (Presentation server version 5.5 on Windows Server 2003 x64). In case if you are using a Proxy service in between, you need to ensure that GTM is able to reach the other server. Application download did not succeed. Check your network connection, or contact your system administrator or network service provider. + Downloading https://download.citrixonline.com/launcher2/static/clickOnce/StarterDotNet20.application?token=e0-f2uWK1wNvMKi1DlguIIwY26Fufkw2DukTsQZk4bE3cLcSyaqAZzluBBHTGAps5jbOarYuUqYKMPeFauFuDMtoEB6fSeKX3418fYVEaLvBDtOMVJ28F33-8sMcpyfqw4jzUJ99veiUk7ogC9KbvIFCpy5NJtxjTUNRAgxQ4B6TLEsgAxjBnn7h051lNIbHCb548Y7ZdIbtE7qnmxYRlyfOZ8d3yiOC407t2HMJcbY5-ndWmRz3_C-6SkbFqnIZtl39w3BpJwYQin-BtdovbpUg_253MVKzxN6XWYtldsfCgSJ2P9duzUtQGwoqdMw3XLhmcpqyD5xAzuRymhkK4h2asxcPmEU-b0LT-CoJjxtGp3tTTIatS_m8nJ4yFXpicTGySyUUg&product=g2m did not succeed. + The remote server returned an error: (407) Proxy Authentication Required. * [4/17/2014 4:42:27 PM] : Activation of https://download.citrixonline.com/launcher2/static/clickOnce/StarterDotNet20.application?token=e0-f2uWK1wNvMKi1DlguIIwY26Fufkw2DukTsQZk4bE3cLcSyaqAZzluBBHTGAps5jbOarYuUqYKMPeFauFuDMtoEB6fSeKX3418fYVEaLvBDtOMVJ28F33-8sMcpyfqw4jzUJ99veiUk7ogC9KbvIFCpy5NJtxjTUNRAgxQ4B6TLEsgAxjBnn7h051lNIbHCb548Y7ZdIbtE7qnmxYRlyfOZ8d3yiOC407t2HMJcbY5-ndWmRz3_C-6SkbFqnIZtl39w3BpJwYQin-BtdovbpUg_253MVKzxN6XWYtldsfCgSJ2P9duzUtQGwoqdMw3XLhmcpqyD5xAzuRymhkK4h2asxcPmEU-b0LT-CoJjxtGp3tTTIatS_m8nJ4yFXpicTGySyUUg&product=g2m has started. – Downloading https://download.citrixonline.com/launcher2/static/clickOnce/StarterDotNet20.application?token=e0-f2uWK1wNvMKi1DlguIIwY26Fufkw2DukTsQZk4bE3cLcSyaqAZzluBBHTGAps5jbOarYuUqYKMPeFauFuDMtoEB6fSeKX3418fYVEaLvBDtOMVJ28F33-8sMcpyfqw4jzUJ99veiUk7ogC9KbvIFCpy5NJtxjTUNRAgxQ4B6TLEsgAxjBnn7h051lNIbHCb548Y7ZdIbtE7qnmxYRlyfOZ8d3yiOC407t2HMJcbY5-ndWmRz3_C-6SkbFqnIZtl39w3BpJwYQin-BtdovbpUg_253MVKzxN6XWYtldsfCgSJ2P9duzUtQGwoqdMw3XLhmcpqyD5xAzuRymhkK4h2asxcPmEU-b0LT-CoJjxtGp3tTTIatS_m8nJ4yFXpicTGySyUUg&product=g2m did not succeed. 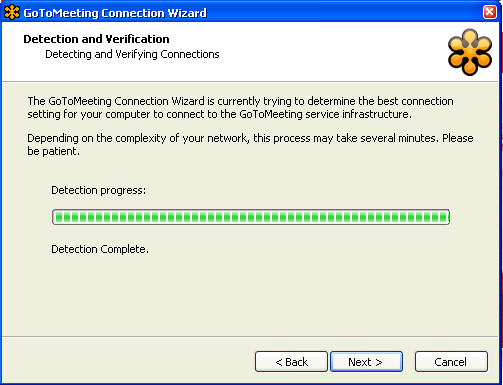 – The remote server returned an error: (407) Proxy Authentication Required. 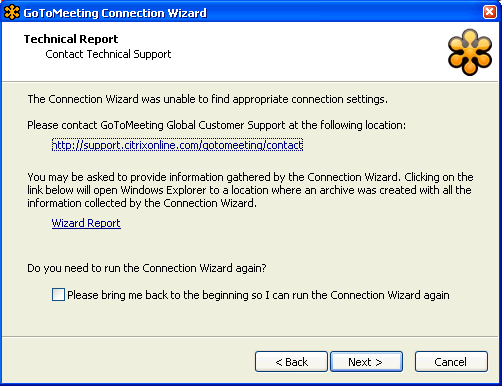 The wizard finds the connectivity to the GoToMeeting download location is correct and accessible. 2014-04-16 03:05:32.088 PST d: [g2mlauncher] <Probe_3> ProbeManager::ProbeThread::Probe::run() – probe returned error (216.219.115.250:80,443,8200). 2014-04-16 03:05:54.103 PST d: [g2mlauncher] <Probe_3> ProbeManager::ProbeThread::Probe::run() – probe returned error on retry (216.219.115.250:80,443,8200). Aborting. 2014-04-16 03:06:29.413 PST W: [g2mcomm] <118062/IPluginControl.start> G2MVoIPThread::isReady() – init() failed! p>Upon investigating the logs and the behaviour of application, I discovered that GoToMeeting is failing to start whenever Audio is disabled in XenApp. To fix this issue, you need to make sure Audio is allowed on XenApp for GTM to launch fine.